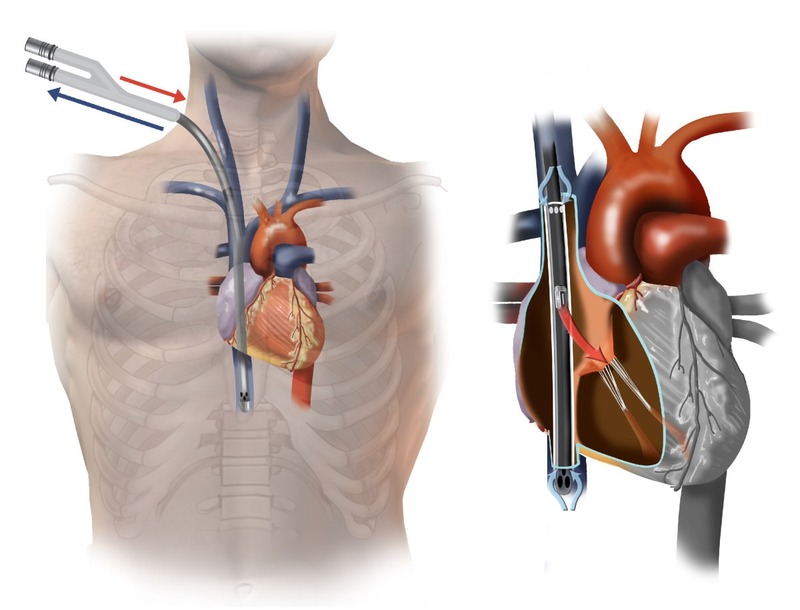 The Alfred ICU uses the Avalon Elite® Bi-Caval Dual Lumen Catheter for veno-venous ECMO support where single catheter internal jugular access is desired. One advantage of this approach is the ability to mobilise the patient (compared with a 2 catheter approach with at least 1 catheter in the femoral vein). Blood is removed from both the SVC and the IVC, passed through an oxygenator and returned into the right atrium. The returning blood flow is directed at the tricuspid valve. Echocardiographic guidance during insertion is vital. In particular, echo can assist with correct placement of the guide wire into the IVC (as opposed to the hepatic vein). Echo will also guide the appropriate depth of insertion and rotational orientation of the catheter. The brief video clips below illustrate how useful Echo really is! Hirose H, Yamane K, Marhefka G, Cavarocchi N. Right ventricular rupture and tamponade caused by malposition of the Avalon cannula for venovenous extracorporeal membrane oxygenation. J Cardiothorac Surg. 2012 Apr 20;7:36. doi: 10.1186/1749-8090-7-36. PMID: 22515939. [article]. Bit of feedback – some longer ECHO clips would be great, these two-second ones make it a bit hard to see what’s going on! We recognise it is less than ideal – and will come up with a better solution! It would be useful to show the TOE multiplane angle given the second loop is strictly speaking, not a classic bicaval view but probably at about 110′ view. Fantastic blog post. The ECHO clips were very informative and educational. We work with some surgeons that only use 31 french catheters regardless BSA.